Using the Nuclear Spectroscopic Telescope Array, astrophysicists will scan debris from supernovas to better understand how they work and use that information to figure out why supercomputer simulations fail to produce an explosion. Somewhere in the Milky Way, a massive old star is about to die a spectacular death. As its nuclear fuel runs out, the star begins to collapse under its own tremendous weight. Crushing pressure triggers new nuclear reactions, setting the stage for a terrifying blast. And then… nothing happens. At least that’s what supercomputers have been telling astrophysicists for decades. 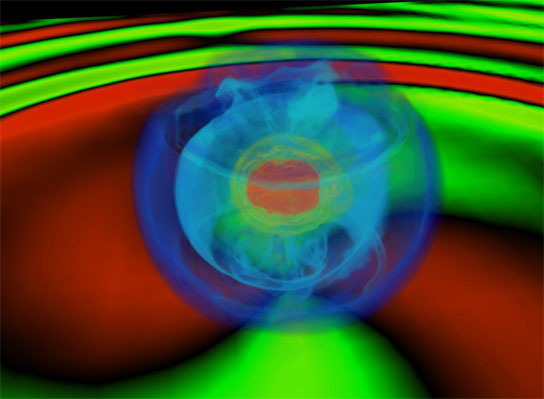 Many of the best computer models of supernovas fail to produce an explosion. At the end of the simulation, gravity wins the day and the star simply collapses. Clearly, physicists are missing something. “We don’t fully understand how supernovas of massive stars work yet,” says Fiona Harrison, an astrophysicist at the California Institute of Technology. To figure out what’s going on, Harrison and colleagues would like to examine the inside of a real supernova while it’s exploding. That’s not possible, so they’re doing the next best thing. Using a telescope named “NuSTAR” –short for Nuclear Spectroscopic Telescope Array — they’ll be scanning the debris from supernovas as soon as possible after the blast. Launched over the Pacific Ocean on June 13, 2012, by a Pegasus XL rocket, NuSTAR is the first space telescope that can focus very high-energy X-rays, producing images roughly 100 times sharper than those possible with previous high-energy X-ray telescopes. When NuSTAR finishes its check-out and becomes fully operational, scientists will use it to scan supernovas for clues etched into the pattern of elements spread throughout the explosion’s debris. 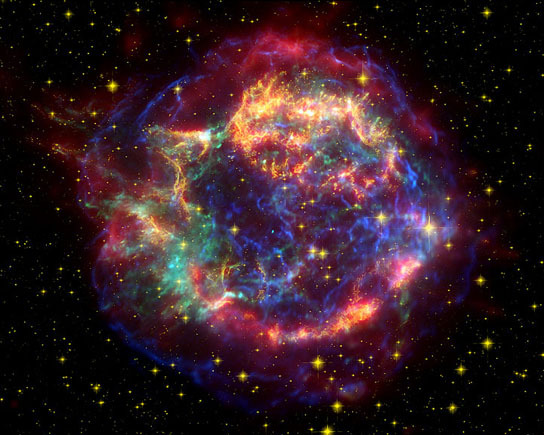 “The distribution of the material in a supernova remnant tells you a lot about the original explosion,” says Harrison. An element of particular interest is titanium-44. Creating this isotope of titanium through nuclear fusion requires a certain combination of energy, pressure, and raw materials. Inside the collapsing star, that combination occurs at a depth that’s very special. Everything below that depth succumbs to gravity and collapses inward to form a black hole. Everything above that depth will be blown outward in the explosion. Titanium-44 is created right at the cusp. So the pattern of how titanium-44 is spread throughout a supernova remnant can reveal a lot about what happened at that crucial threshold during the explosion. And with that information, scientists might be able to figure out what’s wrong with their computer simulations. Some scientists believe the computer models are too symmetrical. Until recently, even with powerful supercomputers, scientists have only been able to simulate a one-dimensional sliver of the star. Scientists just assume that the rest of the star behaves similarly, making the simulated implosion the same in all radial directions. If NuSTAR finds that titanium-44 is spread unevenly, it would be evidence that the explosions themselves were also asymmetrical, Harrison explains. To detect titanium-44, NuSTAR needs to be able to focus very high energy X-rays. Titanium-44 is radioactive, and when it decays it releases photons with an energy of 68 thousand electron volts. Existing X-ray space telescopes, such as NASA’s Chandra X-Ray Observatory, can focus X-rays only up to about 15 thousand electron volts. Normal lenses can’t focus X-rays at all. Glass bends X-rays only a miniscule amount—not enough to form an image. X-ray telescopes use an entirely different kind of “lens” consisting of many concentric shells. They look a bit like the layers of a cylindrical onion. The x-ray “light path” of the EPIC camera of the XMM-Newton satellite, a design similar to that used by NuSTAR. Credit: ESA/ESTEC. Incoming X-rays pass between these layers, which guide the X-rays to the focal surface. It’s not a lens, strictly speaking, because the X-rays reflect off the surfaces of the shells instead of passing through them, but the end result is the same. The NuSTAR team has spent years perfecting delicate manufacturing techniques required to make high-precision X-ray optics for NuSTAR that work at energies as high as 79 thousand electron volts. Be the first to comment on "NuSTAR to Scan Supernovas and Help Improve Computer Simulations"